There are some periods in the history of design that rarely seem to escape the academic or public spotlight: be it the Arts & Crafts movement, the Bauhaus or Postmodernism. I’d add another one: Italy’s post-war design culture. 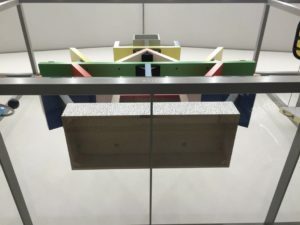 From the 1940s to the 1980s designers such as Vico Magistretti, Gio Ponti and Ettore Sottsass created desirable and progressive designs admired by critics and consumers alike, and which aided Italy’s post-war resurrection and modernisation. That’s how the story of Italian design goes anyway, retold in multiple books, exhibitions and magazines. Arguably Crafting Design in Italy: from Postwar to Postmodernism, published by MUP in 2015, only adds to this bevvy of writing. But in writing the book I wanted to argue that this story is incomplete, and that a key factor has been left out of these repeated retellings: craft. Crafting Design in Italy is the first book to examine craft’s overlooked but central place in the history of Italian design. Based on research conducted for a AHRC Collaborative Doctoral Award at the Royal College of Art and V&A Museum, I argue that craft – multiply conceived as a method of making, a series of disciplines and traditions, as well as a series of concepts such as skill, amateurism and luxury – was fundamental to the design, production, mediation and consumption of Italy’s post-war design culture. 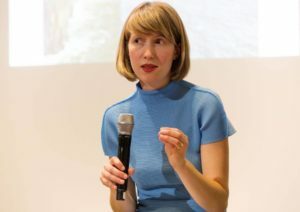 Writing the book offered the opportunity to explore people, places and objects left out in existing narratives of Italian design history, as well as provide re-readings of well-known design objects. This included scrutinising the craft origins of design “icons” such as Gio Ponti’s celebrated Superleggera chair (1957) and looking again at Memphis, the loud, brash design collective whose 1981 launch signalled the arrival of an identifiable postmodern design style. While Memphis aimed to reject the craft foundations of post-war Italian design, it was deeply dependent on this wealth of skills and traditions for its production; a complex relationship of contingency and negation that has defined much of design’s relationship with craft in Italy and elsewhere. In the conclusion I described how I hoped the book would offer arguments around the relationship between design and craft relevant to other contexts and time periods. This includes the current popularity of craft amongst designers today, such as the Sardinian-born duo Formafantasma. This statement led to exploring Formafantasma’s manual-based material experimentation in projects such as Botanica (2010) in the article “Bricolage, Hybridity, Circularity: Crafting Production Strategies in Critical and Conceptual Design”, which I published in Design and Culture (2013) during the book’s development. Academic books take a long time to put together and can be slow burners: I think that interest in the book and its arguments has only grown following its publication two years ago. Since starting the book I’ve mobilised the craft-based approach to examine other overlooked stories in Italian design. This has included The Italian Avant-Garde (Sternberg Press, 2013) which I co-edited with Alex Coles, which sought to revisit Italy’s mythologised Radical Design movement, and which in turn sparked a curatorial interest in Italy’s post-war discotheque phenomenon, another previously unknown but fascinating chapter in this compelling period. Most recently I authored a chapter on Sottsass’s journeys to California and South East Asia in the early 1960s for the exhibition catalogue Hippie Modernism: The Struggle for Utopia, edited by Andrew Blauvelt (Walker Art Center, 2015). His travels had informed works such as his primitivist Ceramiche della tenebre (1962) and Offerta a Shiva (1963) ceramics, which I first discussed in Crafting Design in Italy. 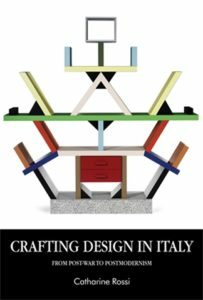 Crafting Des ign in Italy has been the fulcrum of much of my ongoing research in Italy’s fascinating, and multi-faceted, post-war design culture, and I am hugely grateful to Manchester University Press for publishing and continuing to support the book. Category: Art History, Design, material culture	0 Comments.